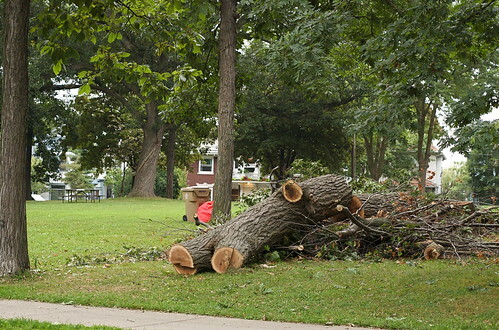 I drove past Orton Park today and was surprised to see a tree down that had been standing as recently as last night. It had clearly been cut down - I looked for any evidence that it had toppled and been cut up. The tree that Cycropia will perform on this coming weekend is visible in the background. It is the one with the obvious scar. The tree appeared healthy at first glance, loaded with foliage and bearing numerous acorns. When I looked at the stump, there is a section that looks rotted. But it didn't extend very far up the trunk, rather it looked more like a chainsaw had been inserted down the trunk but not up. 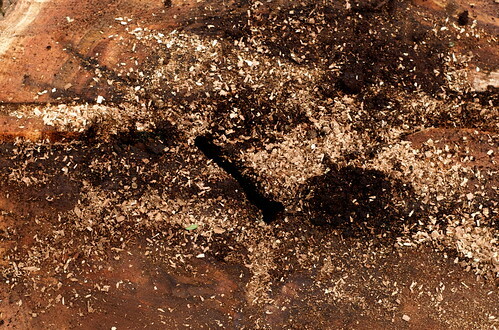 That is not what happened: It was clearly a rotten section, I am just attempting to describe what it looked like in shape. The upper sections of the tree showed no signs of rot to an uninformed observer like me. Does anybody reading this have some insider info? It is pretty distressing to me, since it makes me wonder if the lovely tree that Cycropia flies in each year will fall to whatever made the Madison Forestry department deem this tree to be doomed. Will I drive by in a month and see "our" tree down? While it seems unlikely, the forestry group did just trim a bunch of dead branches out of it. How is the core? I would guess oak wilt... but you can contact your city forestry department to get an answer, they are accountable to you as a citizen. The red oak in question had oak wilt. Over the last six+ weeks the leaves in the core of the crown wilted and turned brown. The majority of the leaves in the crown were brown / dead when the tree was cut. 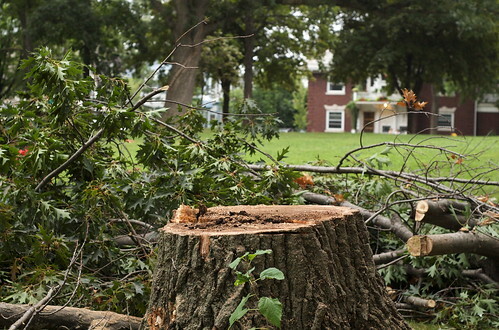 The tree was a goner and cut down to reduce the potential spreading of the oak wilt fungus. 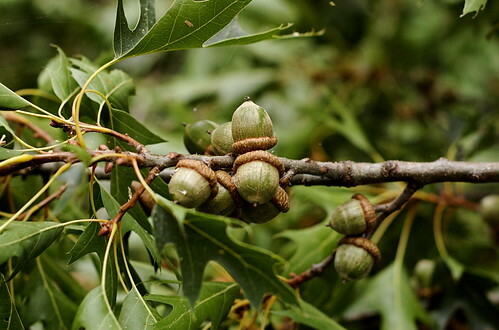 Stress makes the trees more vulnerable to oak wilt. A few ways we can reduce tree stress is not compact their roots by driving vehicles over them, working to eliminate gypsy moths and not yelling at them.